The Mikoyan MiG-35 (NATO reporting name: Fulcrum-F) is a further development of the MiG-29M/M2 and MiG-29K/KUB technology. It is classified as a 4++ generation jet fighter by its manufacturer. The first prototype was a modification of the aircraft that previously served as MiG-29M2 model demonstrator. So far 10 prototypes have been built and are currently subject to extensive field trials. The MiG-35 is now classed as a medium-weight aircraft because its maximum take-off weight has increased by 30 percent which exceeds its previous criteria of classification. MiG Corporation first officially presented the MiG-35 internationally during the Aero India 2007 air show. The MiG-35 was officially unveiled when the Russian Minister of Defence, Sergey Ivanov, visited Lukhovitsky Machine Building Plant "MAPO-MIG". The single seat version is designated MiG-35 and the two-seat version is MiG-35D. The fighter has vastly improved avionics and weapon systems, notably the new AESA radar and the uniquely designed Optical Locator System (OLS), relieves the aircraft from relying on ground-controlled interception (GCI) systems and enables it to conduct independent multi-role missions. There have been references in the late-1980s to a very different design also identified as "MiG-35". This design was a single engined combat aircraft for air-to-air and secondary air-to-ground roles. According to unidentified Indian sources the aircraft was evaluated by Indian pilots in the Soviet Union and was probably suggested as an alternative for the Indian LCA being developed at that time. The MiG-35/MiG-35D exhibits the latest advancements on MiG-29K/KUB and MiG-29M/M2 fighters in combat efficiency enhancement, universality and operational characteristics improvement. The main features of the new design are the fifth-generation information-sighting systems, compatibility with Russian and foreign origin weapons application and an integrated variety of defensive systems to increase combat survivability. The new overall design overtakes the design concepts of the baseline model and enables the new aircraft to conduct full-scale multi-role missions as their western counterparts. New avionics are intended to help the MiG-35 to gain air superiority as well as to perform all-weather precision ground strikes, aerial reconnaissance with opto-electronic and radar equipment and to conduct complex joint missions. The new aircraft has greater weapons load on nine pylons, increased fuel capacity, better anti-corrosion protection, significantly reduced radar signature and a quadruple-redundant fly-by-wire control system. Responding to earlier customer criticism, the new design is substantially more reliable than the previous variants. The airframe lifetime and its service life have been extended and it is fitted with new engines with longer mean time between overhauls (MTBO), resulting in a decrease in flight-hour cost of almost 2.5 times compared to those of the old variants. The new engines are now smokeless and include a FADEC type electronic control system for better performance. All aspect vector nozzles which had been demonstrated on MiG-29OVT are also optional. Other technological improvements were also introduced to enhance the aircraft's ability to conduct independent operations. For example, an airborne oxygen generation plant was added. RAC MiG and the Italian company Elettronica signed a Memorandum of Understanding to provide the MIG-35 with a new multifunction self-protection jammer. Furthermore, the RAC MiG engineers developed a set of training simulators to help pilots master the sophisticated controls of the new aircraft. The simulators offer interactive computer-based training systems and offer full-mission motion simulation. The first demonstrator, a dual-seat aircraft, was built on an existing MiG-29M2 airframe, which previously served as a demonstrator for modifications designated MiG-29MRCA and MiG-29M2. Russia unveiled the MiG-35 at the Aero India 2007 airshow in Bangalore, amid Moscow's keenness to sell these planes to India. It was reported that the MiG-35 made its way from Moscow to Bangalore in less than three hours, assisted by in-flight refueling on the way and flying at supersonic speeds. The MiG-35 is a contender with the Eurofighter Typhoon, F/A-18E/F Super Hornet, Dassault Rafale, JAS 39 Gripen and F-16 Falcon for the bid of more than 126 multirole combat aircraft to be procured by the Indian Air Force in Indian MRCA competition. Aero India 2007 was the first time that the final version of the MiG-35 fighter was displayed in an international air show. 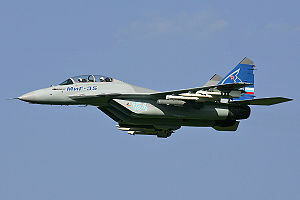 Until then, only the prototype of the MiG-35 had been shown to the public at air shows in Russia and the UK in 2005. It was again demonstrated at Aero India 2009 held at Yelahanka Airbase near Bangalore where it was flown by an Indian Air Force pilot. As of April 2010, pictures and additional info surfaced of two new MiG-35 demonstrators, single-seat MiG-35 bort "961", and two-seat MiG-35D "967". According to Russian media, they have first flown at the beginning of Autumn 2009, and subsequently they took part in MMRCA trials in India starting October 2009. Both have a very high commonality with the previous MiG-29K/KUB airframes, with the immediate visible difference being the braking parachute installed in the place of the hook present on the naval aircraft. Subsequently MiG-35D "967" appears to have been equipped with a similar AESA radar as fitted to the older MiG-35 demonstrator bort "154", identifiable by the dark-grey short nose radome. The most important changes are the Phazotron Zhuk-AE active electronically scanned array (AESA) radar, the RD-33MK engines and the newly designed Optical Locator System (OLS). Other obvious changes in the cockpit are the reduction in analog electronics. The RD-33MK "Morskaya Osa" (Russian: Морская Оса, literally: "Sea Wasp" or Chironex fleckeri) was installed by the new modification. It is the latest version of the RD-33 and was intended to power the MiG-29K and MiG-29KUB. It has 7% more power compared to the baseline model due to the use of modern materials in the cooled blades, providing a higher thrust of 9,000 kgf. In response to earlier criticism, the new engines are smokeless and include systems that reduce infrared and optical visibility. The engines may be fitted with vectored-thrust nozzles, which would result an increase in combat efficiency by 12% to 15%. With the vectored thrust nozzles, the engines are designated RD-33OVT and will allow the MiG-35 to be the first production twin-engine aircraft with vectoring nozzles that can move in two directions or planes. Other current thrust-vectoring aircraft, such as the Su-30MKI and the F-22, have nozzles that each vector in one direction/plane. In recent years the aviation industry has evidenced an increasing use of jet-powered, instrumented, vectored thrust unmanned vehicles ("research drones"), which increase the potential flyable alpha angle of attack beyond 90 degrees angle of attack well into the post-stall effective/safe flight domains and have also replaced some of the traditional uses of wind tunnels. Analogue electronics are minimized, being replaced by 3 equal-size colour liquid-crystal (LCD) multi-function displays (MFDs) and an additional display for the OLS (the MiG-35D rear cockpit has four LCDs). New modifications include the newly rolled-out Phazotron Zhuk-AE active electronically scanned array (AESA) radar and an optronic complex consisting of the newly designed OLS to replace the previous IRST sensor, an additional OLS under the right air intake, and a pair of laser emission detectors on each wing tip. The Phazotron Zhuk-AE AESA radar offers a wider range of operating frequencies, providing more resistance to electronic countermeasures (ECM), more detection range, more air and ground targets detected, tracked and able to be engaged simultaneously. The radar is thought to have detection range of 160 km (86 nmi) for air targets and 300 km (160 nmi) for ships. The OLS, a new development from space technologies, incorporates a helmet-mounted target designation system providing targeting solutions for both ground and air targets in the forward and aft hemispheres of the aircraft. The most vital difference from the previous IRST sensor is that the new device provides not only a better operation range but also offers manually switchable display options of IR view, TV mode or a mix of both that significantly improves man-machine coordination. The OLS on the nose serves as the IRST while the OLS under the right air intake serves as the ground strike designator. Estimates of aerial target range at up to 15 km. Estimates of ground target range of up to 20 km. The defensive system equipment consists of radar reconnaissance, electronic countermeasures, and optical systems - notably the laser emission detector on each wingtip - which are able to detect and evaluate the approaching danger and operate decoy dispensers to counteract the approaching threat in the radar and infrared ranges. The final configuration of the MiG-35's onboard equipment has been left open intentionally using the MIL-STD-1553 bus. The main advantage of an open architecture configuration for its avionics is that future customers will have options to choose from components and systems made by Russian, United States, French and Israeli sources. The Ramenskoe Design Company will act as systems integrator. The MiG-35 is currently in development. Information listed below is preliminary and may change.